In 1968, an event occurred that shaped the rest of my life. 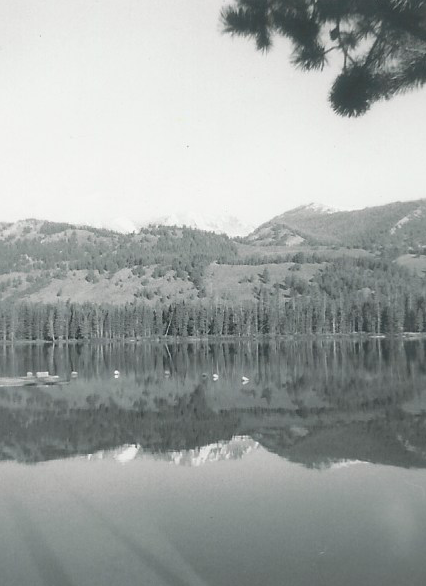 My father took a Camp Director position at Camp Perkins in the Sawtooth Mountains of Idaho for the summer. We pulled our houseboat, The Tortoise with our 1964 Ford Galaxy all the way from southeastern Kansas to Idaho, across the Great Plains and over the Rocky Mountains at 45 miles per hour. I’ll never forget glimpsing the Rockies for the first time. We were someplace in Colorado, and they appeared like distant blue-white clouds on the horizon. It was stunning. Even as a kid, I couldn’t tear my eyes away. I was hooked. We visited National Parks and monuments and drove to the top of Pikes Peak on my eighth birthday. All that summer, the Rocky Mountains provided a far fetched backdrop each day for kids who hadn’t seen much more than flat wheat land during their young lives. For me the mountains felt familiar, comfortable. I felt the same when I went out on the ocean beyond the sight of land for the first time–a peace that was instantaneous and natural, rather than fearful or anxious. Camp Perkins was perched on the shore of an oval lake embraced by archetypal craggy Rocky Mountain peaks. It was jaw-dropping. The water was freezing cold, and probably not more than a mile from the melting snow that fed the lake teaming with rainbow and brown trout. There was a beach, a huge fire pit complete with benches, and a lodge and trading post flanked by small log cabins furnished with sturdy bunk beds. 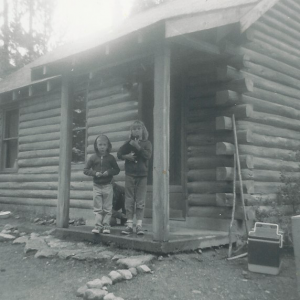 I don’t remember if there was electricity in the cabins or not, or if we had outhouses or proper bathrooms. It didn’t matter. We were flat-landers in the bosom of the Rocky Mountains, and it felt pretty special. Dad was the director of the kids’ camp and Mom ran the Trading Post. There was a cook, a maintenance man and some counselors, all of whom were teenagers, but seemed like full-blown adults to me. Other than getting to meals and staying out of the way, there was little else for us kids to do, though our parents were constantly working: disciplining rowdy kids, troubleshooting generators, woodstoves, plumbing and electrical systems and all kinds of things they were unused to doing on a daily basis. So, they let us run wild. My oldest brother Jon was twelve, Dave was ten, I was eight and Fred was six. We also had two other staff kids Pepper, age eleven and Jan, age seven. Our little gang often roamed the mountains from just after breakfast until dinner, hiking to the inlet and outlet of the lake to discover where the water came from and where it went after it spent time in our lake. We found and created the Garden of the Frogs (play-on-words to the Garden of the Gods that we had visited on our trip to Idaho) and the Witches Forest. We found wide logging roads with eighteen wheelers stacked high with freshly felled trees bound for the sawmill. We caught frogs and fish and observed and learned about nature as only children can. We arrived back at camp generally on time, always wet and filthy, tired and feeling like the Swiss Family Robinson kids. We were mountain children. I’ve often considered how quickly my parents would’ve been locked up and charged with child neglect today. As they say, it was a different time. It was instrumental in shaping the person I have become. I led a hike just last Friday through one of our state parks. It was 13 degrees that morning, but it didn’t matter. 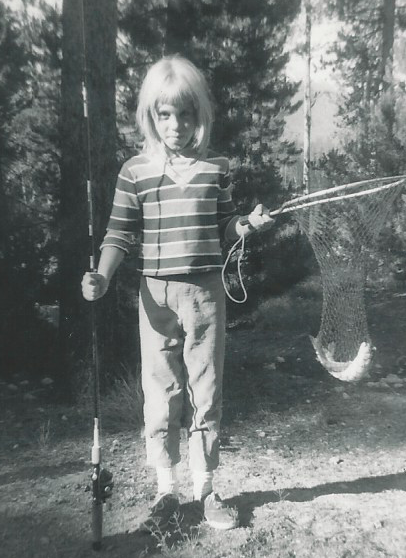 The outdoors has always lured me. It sure did that summer of 1968. Wow. I know I was deprived living in the city, and still lack the connection to nature that you have had all your life. What a gift and blessing. Thanks for sharing. Thank you Sandra. This has been such a wonderful journey into my past. It also makes me realize what an incredible upbringing I had. Thank you Irma! Yes, I’m just now beginning to realize how remarkable it was. A very happy New Year to you as well. I wish you were still in our class!